When I think about the development of leadership during my medical training, I immediately recall residency, where my faculty was 100% male. I learned many lessons from these men, but I felt something was missing. As a chief resident, I was invited to one of the first meetings of the Women in Rhinology section. I can be awkwardly introverted at times; I hesitated as I approached the meeting room and stopped at the threshold. Am I sure I’m invited? What if I’m supposed to contribute something. I’m not prepared. The women in the room came from all career levels, types of practice, and were respected and established leaders. I had read their papers and seen their presentations, but didn’t think I belonged in this group. One of them saw me and kindly beckoned me in. It was like finally taking a deep breath after holding it for way too long. Ah, so this is where the women are and this is how they do it. With that breath came a shift in my perspective. This leadership thing could be for me too. There is a wealth of emerging data that supports the critical role of women in medicine. Women are undisputedly an integral part of the medical community. Female physicians tend to stay in academia longer than their male counterparts. Women assume more teaching roles and play a very direct role in educating future physicians. The patients of female physicians may even have superior outcomes. Female leaders – per objective review of their work and ratings by peers and superiors – were found to be just as, or even more, effective than male leaders. All this data reinforces the importance of women leaders, at all levels, to claim their voices and join the ongoing conversations around us that are influencing patient care and health policy. In short, women belong in leadership. While there is plenty of discouraging data out there as well, it’s important to know this information, as we must continue to make forward progress and not allow our responses to come from a place of negativity. How do you claim your voice and place as a leader? What strategies in real life have been most helpful for you and your ability to amplify the voices of the women physicians around you? Looking forward to continuing the conversation during the AWS tweet chat! Join @WomenSurgeons, Dr. Rebecca Minter (@MinterWiscSurg) and Dr. Kim Templeton (@KimTempleton3) on Monday, November 19th at 8PM EST to discuss leadership skills in surgery. Look for questions from the @WomenSurgeons handle and follow #AWSchat. Check out a prior article by Dr. Heather Yeo on how to participate in a tweetchat. See you there! 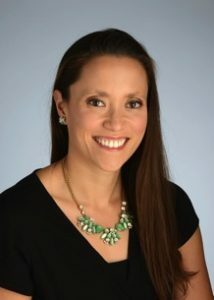 Jennifer A. Villwock (twitter: @docwock) is an otolaryngologist and assistant professor at the University of Kansas Medical Center. Dr. Villwock completed fellowship training in Rhinology and Skull Base Surgery. She also serves as the Section Chief for Otolaryngology at the Kansas City Veterans Affairs Hospital. Dr. Villwock is passionate about physician leadership development, medical education, and population health. She is on the editorial boards of ENTtoday, the Otolaryngology-Head and Neck Surgery Journal, and is the Assistant Editor for Visual Abstracts of the Laryngoscope Investigative Otolaryngology journal. Outside of work, Dr. Villwock enjoys sewing dresses for her 4 year old daughter and spending time at home with family. I met Jen when she was a resident. Maybe she couldn’t see it in herself, but I (older, maybe a bit wiser) could see the leadership potential in her immediately. Also, her bravery. She had her infant girl strapped to her as she presented her poster. I love the way she’s synthesized the thoughts and fears and self-doubt of many or most of us , and how she encourages us here and in real life.